This is the play that was commissioned in 2008 by Northern Constabulary (now part of Police Scotland) and Lochaber Drugs and Alcohol forum. Street youth workers and community police officers were concerned about the very young age of those drinking. The Police wanted to highlight many safety aspects of the consequences of being left alone intoxicated. The play also examines the massive culture of drink in Britain. Often funny, sometimes heartbreaking, never preachy, this is a play that is a perfect springboard to PSE work in secondary schools, and works well within age 11+ transition projects. Homebrew can also be a fantastic feature point in a conference or event. ” a stunning performance of an extremely powerful and moving play” R. Lawson, Teacher. ” I was tearing up at points and laughing my head off at other times” A. Green, parent. “Incredible. The most moving thing I’ve seen in ages” T. Livornese, parent. “it had good life lessons, and I loved Drunken Duncan” S2 pupil. 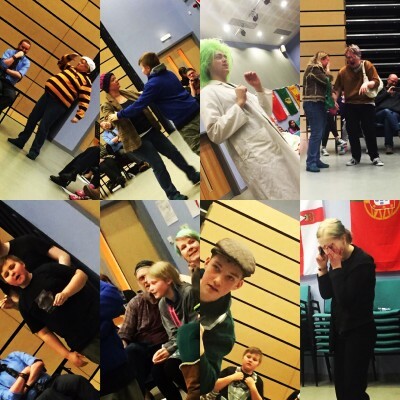 “It was so sad but so funny, and it made me think.” S3 pupil. “This should be seen all over Scotland” P Griffin, Teacher. Best performed by: Adults with teenagers. Suitable for classroom script reading? Yes, but best acted out. Audience Age best for: 11-15, and adults working with teens in youth and health related projects. Curriculum benefits: PSE/PLP, Drama, English, RME, plus health and wellbeing/alcohol projects. Cast: 5 2 teen/young adult males, 1 adult female, 2 teen/young adult females NB some actors will need to multi role, especially important for one male to be able to play a middle aged alcoholic. Sound & Light: Works well without lighting. Pre-recorded sounds and music needed. Live singing and possible live music. Set: Can be simple or complex. Works well in thrust or theatre in the round staging. Can work with no set and some props.